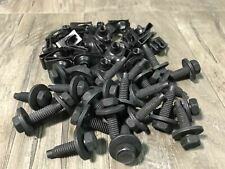 25 pcs Buick Chevy Pontiac Cadillac cone point fender body bolts 5/16-18 x 7/8"
Chevy Buick Cadillac Pontiac fender bolts & short "U" nuts 5/16-18 x 1-3/16"
10 pcs Chevy Buick Cadillac Pontiac fender under hood bolts 5/16-18 x 1-3/16"
Precision Restoration Parts, originally started by and for truck enthusiasts, is a leading manufacturer of high quality, reverse-engineered weatherstrippingfor all vehicles. "Precision Parts Molding Clip --. You are buying twenty (20) NEW fasteners. They are 5/16-18 x 3/4" long stainless steel, socket Flanged button cap screws and 5/16-18 black phosphate steel "U" panel nuts (short). 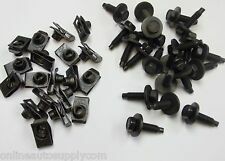 You are buying twenty five (25) NEW fasteners. They are great for fender, under hood, body, trunk, etc. Fits various years and models of Chevy, Buick, Cadillac and Pontiac. Compatability List is for Suggestion Only. Unit Quantity: 1 Set ( 25 Bolts / 25 U Nuts ). 25 qty 5/16-18 Coarse Thread Short "U" Nuts. You are buying four (4) NEW plugs. You will need to check your application. These plugs have a. 400" OD and are great for blocking off intake manifold water ports, water pump ports, water temp & oil sender holes, engine block holes, etc. Do the job once, do it in stainless steel! You are buying four (4) NEW plugs. You will need to check your application. These plugs have a. 535" OD and are great for blocking off intake manifold water ports, water pump ports, water temp & oil sender holes, engine block holes, etc. Do the job once, do it in stainless steel! You are buying fifty (50) NEW fasteners. 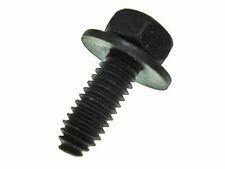 The black finish steel extruded "U" nuts are 5/16-18 (coarse thread) and are the long nuts. They have a panel range of. 025 to. 150 and an edge of panel to center of the hole of. 810" to. 850". You are buying sixteen (16) NEW fasteners. You are buying twenty five (25) NEW fasteners. They are great for fender, under hood, body, trunk, etc. fender & under hood bolts. You are buying four (4) NEW plugs. You will need to check your application. These plugs have a. 385" OD and are great for blocking off intake manifold water ports, water pump ports, water temp & oil sender holes, engine block holes, etc. You are buying twenty five (25) NEW fasteners. These nuts are great for fender, inner fender, under hood, etc. applications or anywhere a 1/4-20 nut is needed. 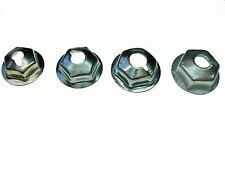 The zinc finish steel extruded "U" nuts are 1/4-20 (coarse thread) and are the short nuts. 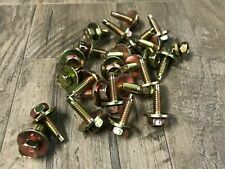 You are buying twelve (12) NEW fasteners. They are great for fender, under hood, body, trunk, etc. You are buying four (4) NEW plugs. You will need to check your application. These plugs have a. 530" OD and are great for blocking off intake manifold water ports, water pump ports, water temp & oil sender holes, engine block holes, etc. 2 Wheel Eyebrow Strip Protector Trims. 1 Paste film. - Flexible enough to wheel wells perfectly. - Cover the scratches, add a luxury look to your car. We will try our best to reduce the risk of the custom duties. 1000PCS Universal Mixed auto fastener. Used widely for car fender, bumper, door or other car suface. These rivets are made of the plastic material. 2X 59" Universal Car Fender Lip Flare Wheel Moulding Trim Protector Carbon Look. 2pcs 150cm Car Fender Flare Extension Wheel Eyebrow Moulding Trim Protector Lip. 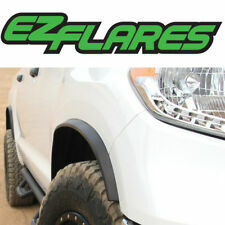 2 x Fender Flares Protector. Color:Carbon Fibre Color. 2Pcs 5.5cm/1.5M Widening Car Fender Flare Wheel Eyebrow Trim Carbon Fiber Color. 2 x Fender Flares Protector. Color:Carbon Fibre Color. Material: Rubber. Flexible enough to conform to different types of car body. Car Wheel Trim 2x 1.5m Universal Rubber Fender Moulding Flares Protection Strip. 2pcs 150cm Car Fender Flare Extension Wheel Eyebrow Moulding Trim Protector Lip. 2 x Fender Flares Protector. Material: Rubber. 2pcs 150cm Car Fender Flare Extension Wheel Eyebrow Moulding Trim Protector Lip. 2x 55mm 1.5m Car Wheel Fender Extension Flares Arch Protector Rubber Moulding Retrofit. 55mm Car Wheel Fender Extension Flares Arch Protector Rubber Moulding Retrofit. You are buying twenty five (25) NEW fasteners. These nuts have a. 035" to. 205" panel range and center of hole to edge of 3/4". They are great for fender, under hood, etc. 3/8-16 "U" nuts. You are buying twenty five (25) NEW fasteners. They are great for fender, under hood, etc. You are buying twenty five (25) NEW fasteners. These nuts have a. 035" to. 220" panel range and center of hole to edge of 1-1/8". They are great for fender, under hood, etc. 3/8-16 "U" nuts. You are buying twenty (20) NEW fasteners. They are 5/16-18 x 1" long stainless steel, serrated flange, indented hex head cap screws and 5/16-18 black phosphate steel "U" panel nuts (long). 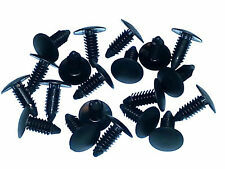 You are buying ten (10) NEW fasteners. They are great for fender, under hood, etc.